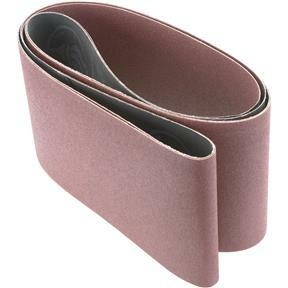 6" x 80" A/O Sanding Belt 80 Grit, 2 pk. Woodstock - 6" x 80" A/O Sanding Belt 80 Grit, 2 pk. These tough Aluminum Oxide 80 grit 6" x 80" sanding belts are sized right for all of your belt sanding needs and are sold in a 2 pack. I'm using these on a shop-made thickness drum sander and their just perfect for the 5" dia. x 24" wide drum. I'm already using this range of sanding belts. Just needed 80 grit as well. These belts work well. I have been using these belts in my sander for years and am quite satisfied with the product.